The following patient-related resources provide guidance in effectively maintaining and enhancing the doctor-patient relationship. Governor Cuomo signed legislation on December 31, 2016 that would add new protections for patients when their health insurance plans require them to go through “step therapy” or “fail first” protocols when accessing prescriptions drugs to treat a medical condition(s). The new law took effect on January 1, 2017 but was applicable to “health insurance plans delivered, issued for delivery, or renewed after that date”. As January 1, 2018 rapidly approaches, the Chapter reminds members that the new law applies to all state-regulated commercial health insurers, HMO plans, Medicaid Managed Care plans and Child Health Plus plans. The new law does not apply to Medicare, Medicaid fee-for-service or “self-insured” plans which are exempted by the federal Employee Retirement Income Security Act of 1974 (ERISA). Through stakeholder collaborations, several resource fact sheets have been prepared for both physicians and patients. These documents were created in a Q&A format for the purpose of explaining the law, providing details about requirements and compliance by health insurance plans, and dispensing valuable information about the appeals process. These documents have been provided through a joint collaboration with Reid, McNally, and Savage LLC, and Cary Collaborative Strategies. 8.3.17: August is National Immunization Awareness Month - New Resources Available! ACP Adult Immunization & Quality Improvement for Residents, featuring evidence-based strategies for increasing vaccination rates. Recommended adult immunization schedule issued by the Advisory Committee on Immunization Practices, published in Annals of Internal Medicine. Are a man or woman who become (or became) ill with symptoms of Zika virus within 4 weeks of travel to a place where Zika virus is being transmitted. 2. Patients can obtain a “Zika virus testing approval form” from Local Health Departments (LHDS): You can work with a patient to get this approval (Contact information for LHDs is available here). They MUST get approval from their LHD before they can get tested. The form can be emailed to you or the patient. The form could also be faxed. 3. Provide a Zika virus test prescription for your patients: In addition to getting LHD approval for testing, you can give your patients a prescription for the lab tests that are needed. 4. Provide your patient with collection site phone numbers if an appointment is needed: A list of hospitals and their laboratory telephone numbers is available to provide to your patient. (Health Commerce System Login is required). 5. Instruct the patient to go to the collection site: A patient will need to bring the approval form from the LHD and the prescription from you provided. The sample collection site is not able to provide any lab testing unless they are given both the health department approval form and the prescription you've provided. At the collection site, blood and urine samples will be collected and sent to Wadsworth Center, the New York State public health laboratory, for Zika virus testing. There will be no charge to the patient for the blood and urine collection, shipping and testing. Inform the patient to wear short sleeves or sleeves that can easily be rolled up. 6. Results of the patient's tests: Testing for Zika virus infection is a two-step process. The first test results will be available within a few days of the sample collection. However, in most cases, additional testing is required to determine if a patient was infected; these results may take up to 21 days due to the complicated nature of the tests involved. Some people may need additional blood samples collected three weeks after the first samples. Test results will be sent to your office, and your patient can discuss their results with you and ask any questions they may have. 7. Questions? Patients can contact their Local Health Department or the New York State Department of Health at 1-888-364-4723. Instructions for Zika virus testing for NYC residents can be found here. They can also read the Department of Health FAQ on the Zika virus here. In addition, patients can call the Zika information line at (888)364-4723 from Monday - Friday, 9 am to 6 pm. The “Get Smart (Know When Antibiotics Work) Campaign” is a collaborative effort between the New York State Department of Health (NYSDOH) and the Centers for Disease Control and Prevention (CDC). CDC has provided grant funding to New York State in an effort to combat antibiotic resistance and the “superbugs” that arise from avoidable prescribing of antibiotics. To get a handle on where New York stands, the "Get Smart Campaign" analyzed 2013 Medicaid claims data on prescribing for adult upper respiratory infections and found that in 11 counties in New York State, over 55 percent of provider visits resulted in antibiotics being prescribed for adults with upper respiratory infections (URIs). This map shows that data. Some healthcare providers say they prescribe antibiotics even when they know they are not indicated because of pressure from patients for a post-office visit “takeaway”. There is concern that they might get negative reviews on patient satisfaction forms if patients are denied antibiotics. In addition, ACP has released a clinical guideline for Appropriate Antibiotic Use for Acute Respiratory Tract Infection in Adults that coincides with these issues. If you are interested in joining the “Get Smart” effort in New York State or becoming a “champion” of appropriate antibiotic prescribing (setting an example helps every community), please contact Mary Beth Wenger, Project Coordinator of the New York “Get Smart Campaign" at 518-474-1036 or email her at: marybeth.wenger@health.ny.gov. The Campaign to ImmuNYze all New Yorkers is an initiative of the County Health Officials of New York (NYSACHO) in partnership with NYACP to bring together patients, parents, providers and campaign partners to heighten awareness of the need to immunize throughout life-from infancy through senior years. Campaign Materials Are Available ! The Campaign strives to provide up-to-date, accessible information about childhood and adult immunizations with the goal of increasing vaccination rates throughout the state. The Campaign’s positive immunization messages are available to the public, vaccine providers and our partners. You can download and reproduce any of the campaign materials posted on our website for use in your practice and as educational vaccination information for patients. Your local health department can help make you an Immunization Champion. We encourage you to reach out to your local health department with questions regarding vaccines, schedules, vaccine storage and handling and related issues. Your local health department can also assist you in identifying your practice’s immunization rates. Local health departments can also connect you to opportunities to partner with others to promote immunizations in your community. To contact your local health department, visit our directory page and click on the county where your practice is located. 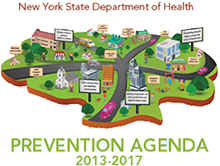 A selected group of 58 Prevention Agenda objectives were chosen to be tracked annually for New York State. Each priority-specific committee was charged with developing objectives for the general population, as well as objectives for reducing disparities for specific populations that are disproportionally impacted. The final set of measurable objectives was developed by reviewing indicators used in the National Prevention Strategy, County Health Rankings, America's Health Rankings, Healthy People 2020, and by the CDC and the New York State Department of Health. Committees selected indicators that were relevant to the priority-specific focus areas and goals; that represented process, short-term and long- term outcome indicators; and that can be measured with available data. Whenever possible, indicators with data available by county, race/ethnicity, disability and socioeconomic status were chosen. In many instances, disparity is measured by the ratio or the difference between the population of interest (e.g., Black, non-Hispanic, Hispanic, Medicaid) and the corresponding reference population (e.g., White non-Hispanic, non-Medicaid). Vaccines are not just for children. The CDC has developed standards for providers for adult vaccination that can guide you in making recommendations to your adult patients. Are your employees up to date on their vaccines? Health care personnel not only administer vaccines, they need them too. 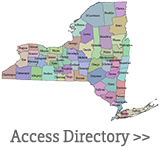 Visit the New York State Department of Health to learn more about requirements and recommendations for health care personnel. Group Visits: Resources and information to help a practice implement group visits. Efficiency Through Effective Interviewing: This 20-minute video demonstrates patient techniques for efficient and effective exam room interviews.